Here are some of the post fight interviews from A Night of Combat II including Jay Hieron, Kim Couture, Josh Haynes, and more. For those that were not able to catch the fights live in Las Vegas at the Thomas and Mack center, they will be broadcast on HDNet on Friday, Oct. 17th, check your local listings for times. A special thanks to Aaron Mello-Fisher and Livia Mello-Fisher for thier work in making these videos. 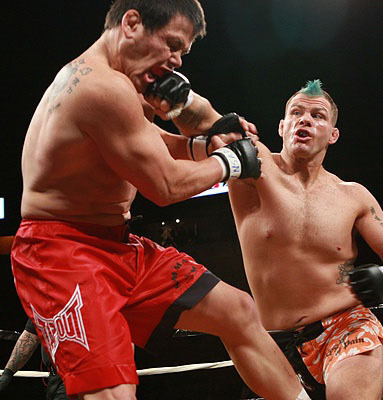 They can be contacted at aaron@fightersreality.com. Bull Riding superstar Ty Murray stopped by the gym to check on his pal Josh Haynes today. 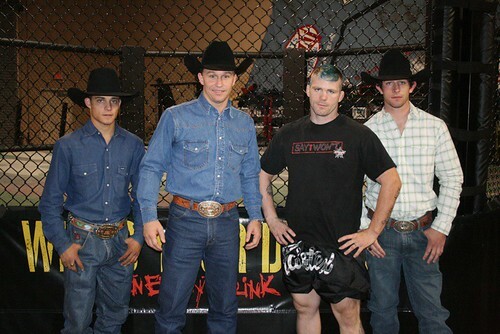 Ty and Josh got to be good buddies during the filming of Celebrity Bull Riding, and Ty has followed Josh’s MMA career since. Upcoming Professional Bull Riding (PBR) stars Brian Canter and Ned Cross also made the trip to the gym. 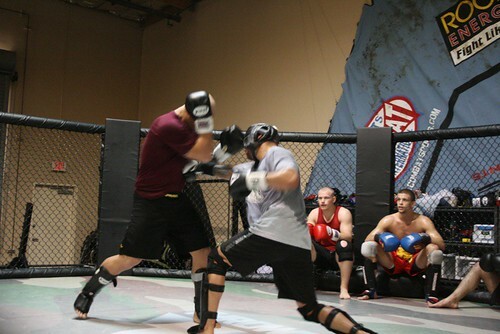 Both are big fans of MMA and came to watch Pro Practice. Ned threw on some shorts and a T-shirt and got out there with Josh for some pointers. Seems Ned got suckerpunched a few months back. 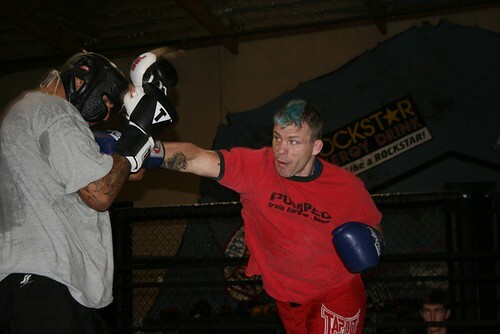 Josh taught him how to keep his hands up and throw a clean jab. 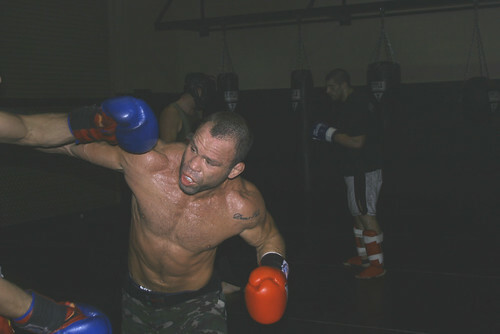 Josh’s next fight is November 10th in San Antonio. There’s buzz around Las Vegas that the IFO is looking to set up a battle of the brawlers between Josh Haynes and Marvin Eastman early next year for the IFO 185lb title. Again, it’s just a rumor at this point, but it’s a fight we’d love to see. Both guys like to stand and bang. Fans will be going home from that one with something to talk about. If you’re in Vegas and like Bull Riding, the PBR is at the Thomas & Mack Center this weekend. The author of this blog had the opportunity to attend the PBR event at Mandalay Bay on Saturday. Awesome! Those guys take a pounding. The bulls are phenomenal athletes and are incredibly impressive up close. Josh Haynes wins by first round TKO in Stockton, California. Stopping local favorite Steve Heath with a big right hand followed by three more shots on the ground. Here’s a good writeup by the Stockton Register. 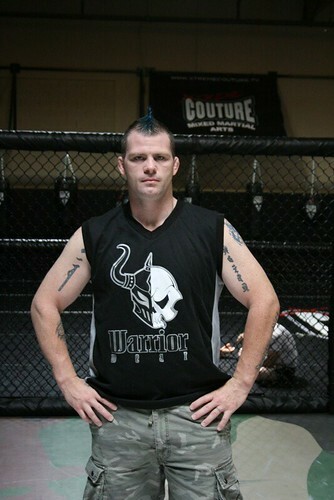 Josh Haynes is the latest fighter to relocate to Vegas to join Team Couture. Josh made the move from Oregon where he trained with Team Quest. 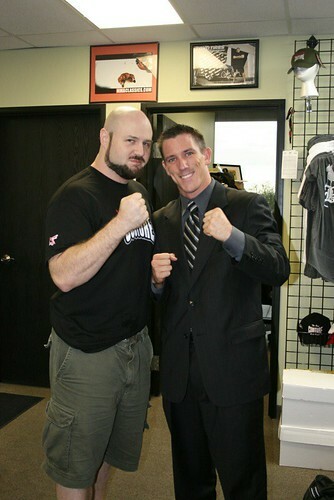 A few years back Josh met Randy when “The Natural” was with Team Quest. 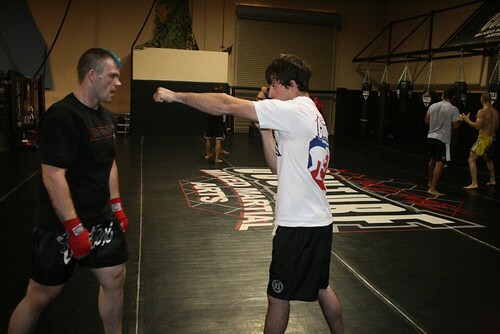 Randy invited Josh to train with him. But it took Josh some time to get in a position where he could move (read Josh’s amazing story here) and by the time he got to Oregon, Randy had left for Las Vegas. In addition to getting his career back on track with our world class fight team, Josh is going to help take our Kids Program to the next level. 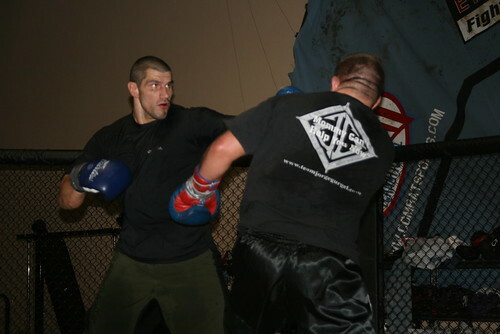 Josh will be teaching an Advanced Kids Class on Tuesdays and Thursdays from 6-7pm in the cage. He’ll teach beginners Saturdays from 11am-noon and an Advanced class on Saturdays from 1pm-2pm. He’ll also begin holding Kids submission tournaments. We’ll announce the date of the first one soon. The kids are going to be in good hands. They’re with a professional. We’re thrilled to have him as part of the team.